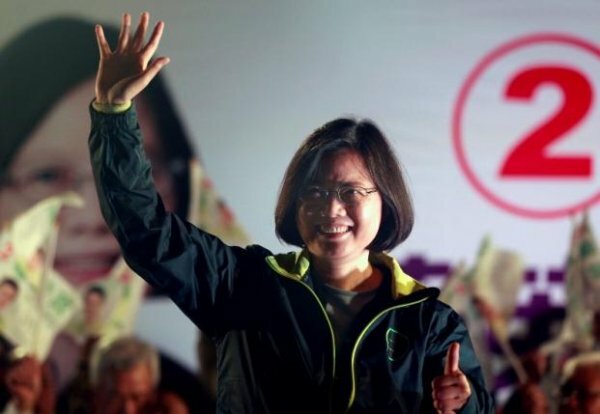 Ahead of the next presidential elections in Taiwan, the last opinion poll has revealed a large margin of preference for the candidate of the Democratic Progressive Party (DPP), Ms Tsai Ing-wen. According to the poll, DPP is leading with 45% of the vote intentions, versus only 16% for the ruling Nationalists (KMT). Approximately 22% of all respondents were still undecided. The elections will take place on 16 January 2016, amidst increasing uncertainty over cross-strait relations with the People’s Republic of China. The leader of Taiwan's independence-leaning Democratic Progressive Party (DPP), an organization loathed by rulers in giant neighbor China, was top of the last opinion poll on Tuesday before a polling blackout begins ahead of the Jan. 16 elections. The poll by Taiwan's Cross-Strait Policy Association showed 45.2 percent of 1,052 people surveyed supported Tsai Ing-wen, chairwoman of the DPP, while 16.3 percent backed Eric Chu, chairman and candidate for the ruling Nationalists (KMT). The margin of Tsai's expected victory is important in terms of how fiercely democratic Taiwan gets on with Communist-ruled China, which considers the island a breakaway province. The DPP has been supported by youthful voters angered by a perceived economic dependence on the mainland. The links between Beijing and the DPP will be crucial to managing one of the world's most potentially dangerous relationships, with Taiwan facing a China that aims hundreds of missiles at the island and has never renounced the use of force to bring it under Beijing's control. The DPP is detested by Beijing because the party believes the future of Taiwan is for its 23 million people to decide, which Beijing takes to mean independence. China has regarded Taiwan as a renegade province ever since Chiang Kai-shek's defeated Nationalists fled to the island in 1949 after losing the Chinese civil war to Mao Zedong's Communists. The association's poll showed 59-year-old Tsai's approval rating over 54 percent for respondents aged between 20 and 34. However, it also showed that 22.4 percent of all respondents were undecided about their presidential pick. Tsai's support rating rose by one percentage point from the last poll in late December by the association, made up of prominent scholars and bipartisan figures. In comparison, Chu's rating was down by 5.8 percentage points. Surveys in recent months have shown Tsai holding on average a double-digit lead against her rivals, which include a third presidential candidate from a minority party. The island's 113-seat parliament will also be up for grabs in the elections. TVBS, a cable television channel in Taiwan, put Tsai's support at 44 percent, or 20 percentage points ahead of Chu, in a poll conducted on Saturday. A poll sponsored by the Nationalists and issued on Monday put Tsai's support at 39.2 percent, ahead of 31.2 percent support for Chu.